(PPÖ/Vienna) – Michael (12), from Kematen an der Krems in Upper Austria, was a very proud teenager when he travelled to Bethlehem last Tuesday. 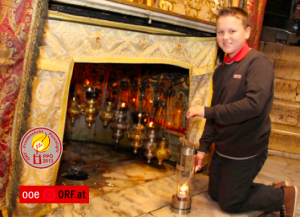 In fact, he had been selected to light this year’s ORF Peace Light at the eternal flame in the Church of the Nativity and to safely carry the lantern back to Austria. This is the 28th year that the Upper Austrian Studio of the Austrian Broadcasting Company (ORF Oberösterreich) is organising this activity, which has become one of the better known traditions marking the period before the days when Christians around the world celebrate the birth of Jesus. 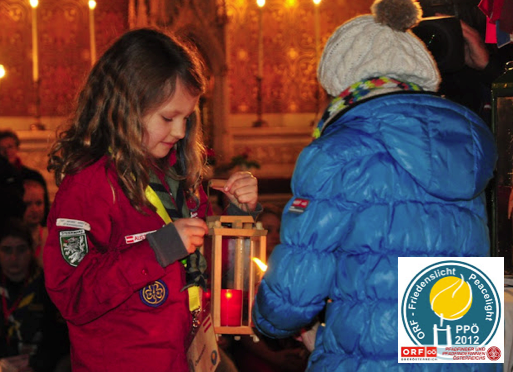 And it will be the 25th year that Scouts and Guides of Pfadfinder und Pfadfinderinnen Österreichs will play a very active part in distributing the ORF Peace Light to many communities, villages, towns within Austria, as well as across Europe and beyond. This silver jubilee will be celebrated at a special reception just before the Peace Light Ceremony and bring together many of those who were and continue being involved in this project. 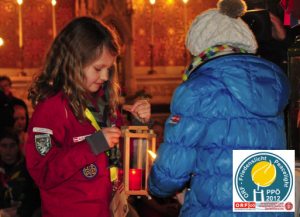 To help this symbol of hope and peace reach as many families and communities as possible, the Scouts and Guides of Austria are once again inviting representatives of member organisations of WOSM and WAGGGS to a special ecumenical ceremony in Vienna. 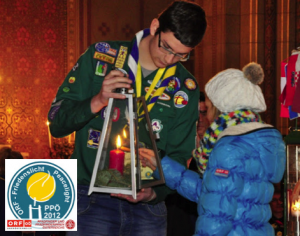 This year it will take place in the Roman Catholic Votivkirche in down town Vienna on Saturday, 14 December 2013. The ecumenical ceremony will see representatives of more than 25 NSOs from Europe and beyond gather to celebrate peace, harmony and understanding under the motto “Something small gets big“, a theme picked up from the Bible’s Book of the Prophet Micah (chapter 5,1). 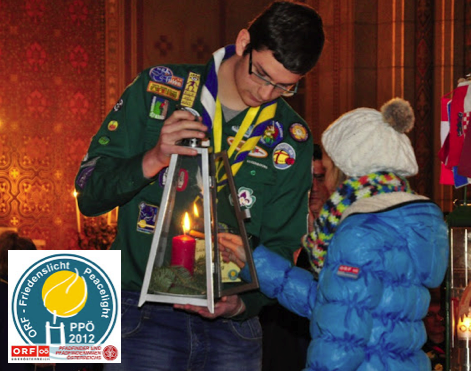 The story not only refers to Micah’s prophecy of the coming of Jesus, Son of God, but also to the fact that PPÖ’s involvement in the Peace Light activity has grown from a small local project with some 100 Scouts and Guides to a global project reaching out to all corners of the world and across different cultures and denominations. For the first time this year, the World Organisation of the Scout Movement (WOSM) and its Messengers of Peace initiative are joining the activity. A special website will be created on scout.org where participants from around the world can share their stories, pictures and videos. And a world map will allow those carrying the ORF Peace Light Lantern to mark their destination and others to monitor the many destinations the symbol of peace and hope will reach. Check scout.org regularly for updates. And do not forget contacting your association to check how you can join the group bringing the ORF Peace Light to your country and to find out how it is spread within your country. Ďakujem Slovenská skauting pre váš veľmi pekný príbeh!